We were proud to be a sponsor of the Society of Industrial and Office Realtors (SIOR) Great Lakes Networking Conference that took place August 21-22nd in Louisville, KY. Hosted by the Indiana/Kentucky SIOR Chapter, myself (Landon Paddock) and a team of Project Managers (Corey Rose, Mike Armstrong, and Alex Hahn) enjoyed some good bourbon and good laughs with clients from all around the Midwest. 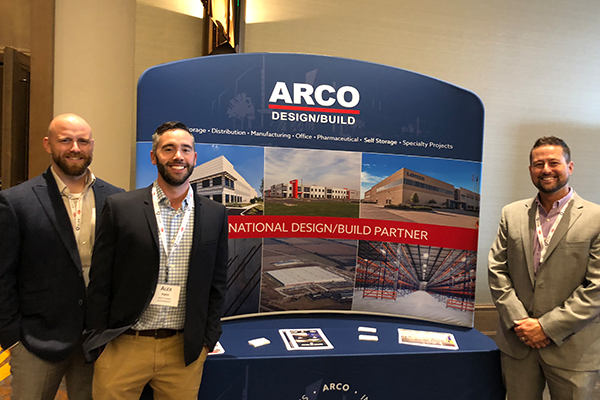 The registration kicked off with every participant receiving their ARCO bag and catching up with new and old acquaintances within the industry. The group then hopped on a trolley and headed to the Muhammad Ali Museum. After grabbing a quick lunch, we had the privilege to tour and learn about one of the most influential Americans of all time. After the inspirational museum visit, we headed over to Angel’s Envy Distillery for a bourbon tour and tasting. We were able to enjoy some good bourbon while sharing conversations with several clients and prospects. Following the event, the entire group of about 150 participants enjoyed an excellent dinner at Eddie Merlot’s. The SIOR event organizers made it comfortable for our large group by renting out the entire restaurant for the evening. The following morning, everyone attended the breakfast panel discussion to hear more about the robust Louisville market. In the past 5 years, Louisville has become a national attraction for local and national speculative (spec) development. The market has been at an all-time high hitting record for spec construction year after year with end-users still looking to stake their flag in Louisville. To end a great networking event, all participants were given the option to enjoy a round of golf at the beautiful Valhalla Golf Club. We hosted 25 golfers on the Championship Golf Course and everyone thoroughly enjoyed their time on the grounds that afternoon. Our goal is to make sure that we leave a smile on our clients faces and hope they enjoy their time with us. Whether it’s over a glass of bourbon, or a couple holes on the golf course, ARCO has undoubtedly made a name for itself in Louisville and the Midwest, and we plan to keep it that way! Do You Have an Upcoming Design-Build Project We Can Help You With? Let us know what your next design-build project is and we'll give you the full benefit of our expertise.